As a pet owner, I am sure you have come to dread Guy Fawkes, or any event that involves fireworks. If we think the noise of fireworks is loud, just imagine what your pooch can hear. According to headstuff.org, thanks to a shape of their ears and the fact that they have 18 muscles controlling them (as opposed to a human’s six), dogs can hear sounds four times further away than humans can, and at a much higher frequency. And a cat’s hearing is even better. The amount of pets that go missing, get injured or even pass away over this ‘holiday’ is testament to the lengths dogs will go to to get away from the noise. Plan to stay with your pet if you can. A familiar face and voice will go a long way in bringing comfort. Keep him inside and close the curtains. Not only are the loud sounds diminished, but there are less chances of him injuring himself or running away. Don’t overly coddle him. As humans, we might like a hug to calm us down, but for most dogs, this will just make them even more anxious. Depending on your dog, some like to be petted (use a firm sweeping motion down their back), and some find their ears being fondled soothing. It’s entirely up to your dog though, so test out what works for him beforehand. Play soothing music or turn the TV up to minimise the sound. Distract him. Play his favourite game and reward him with treats. He’ll start to associate the loud noises with positive experiences, rather than scary ones. Give him a herbal supplement. 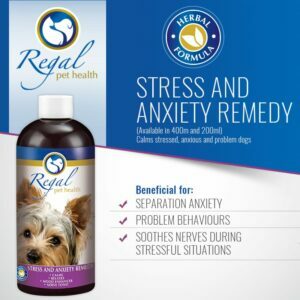 Regal Stress & Anxiety Remedy has been specifically formulated with three effective herbs known for calming stressed and anxious dogs. Put them in a Thunder Vest. A ThunderVest works in a similar way to swaddling a baby to sooth them. It is a unique dog anxiety wrap, designed to provide gentle, constant pressure to your dog’s torso, resulting in a calming effect. Make sure he has identification. 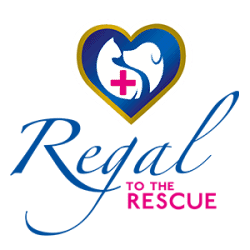 In the event that your dog does escape during a time of trauma, make sure he is either chipped or wearing Identification, so he can be reunited with you as soon as possible. This herbal nerve tonic is beneficial for dogs prone to separation anxiety and problem behaviours (including barking, biting, aggression and hyperactivity). It can also be given to soothe nerves during stressful situations such as thunderstorms, fireworks or a car trip.